What was your inspiration for starting Brooklyn Delhi? I have been specializing in developing, teaching and serving Indian recipes using local and seasonal ingredients available to me in Brooklyn, NY since 2009 at The ABCD’s of Cooking. I’m currently also writing a cookbook for Ten Speed Press (June, 2016) on that same topic focused on South Indian home cooking using local ingredients. 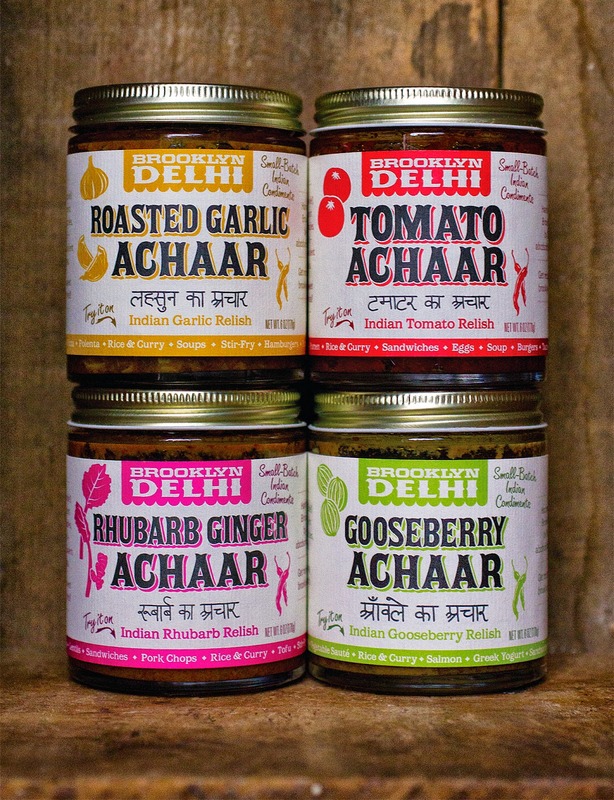 It was a natural progression for me to offer achaars that supported local farmers and growers at Brooklyn Delhi. Growing up I ate A LOT of achaar. I would always bring back copious amounts of achaars from my family in India. I realized though that the achaars sold in stores near me in the US were laden with salt and bad oils and lacked that homemade flavor, which led me to make my own. Achaar-making in India has always centered around using seasonal fruits or vegetables so taking a page from that tradition, my achaar recipes were inspired by the vegetables and fruits, like rhubarb, gooseberries, etc., I received in my weekly farm share. I started serving these achaars at my pop-up dinners and cooking classes and got such a good response that my husband (fiancé at the time) encouraged me to bottle them. Brooklyn Delhi is a fun play on words that reflects the recipes I make - founded in Indian cooking traditions but inspired by what is grown around me in Brooklyn, NY. My father is from Delhi and actually writes the Hindi translation that appears on all of our bottles. My husband, Ben is a food packaging designer with over a decade of experience so I was lucky in the logo and branding department. Taking cues from hand-painted Indian street and truck art and the look of classic Brooklyn deli awnings, Ben designed the Brooklyn Delhi logo and packaging that reflected a combination of the two. Our site is built on Shopify and our email campaigns come from Mailchimp. To get the word out, I use a lot of social media sites like Twitter, Facebook and Instagram. It's been a really effective and free way to promote the business. I'm hoping Indian flavors.... I do think that the general public is getting hungry for more complex flavors, not just spicy but sour, sweet, savory and spicy all at once and I think that definitely will be evident not only in new food products, but also drink flavors coming out.